Inspired Color. Defined Performance. : What is Solution Dye? There are many decisions to make when you are looking to produce a top quality product. You want the best for your customers. When you think about things from your customer’s perspective, product and process decisions seem obvious. Who wouldn't want to have a more durable product? Who wouldn't want a product that is more resistant to fading? A product that stands up to stands up to harsh cleaners? A product that’s more environmentally sound? When it comes to synthetic fibers, the obvious choice is solution dyed fibers. But what is Solution Dye? 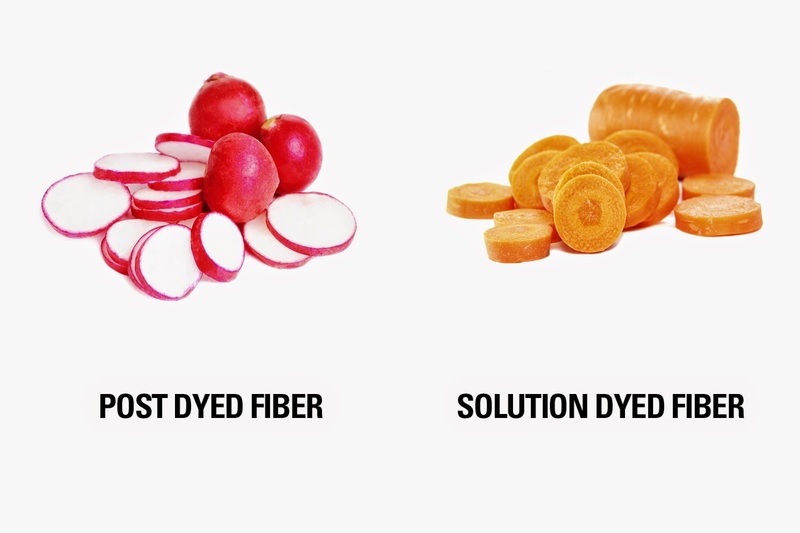 Think of the difference between solution dyeing and post dyeing as the difference between a carrot and a radish. The radish represents post dyed fiber, which is dyed after the fiber is spun. In post dyeing, color only coats the outside of the fiber while the inside remains uncolored. This leads to rapid color fade. The carrot represents solution dyed fiber, where the fiber is colored throughout, clear to the very core. This prevents color fading and keeps your fiber looking newer, longer. Yarn that is produced by the solution dye method has color that is added before the fiber is spun. As a result, these colorants become an integral part of the fiber. Solution dyeing can be used in multiple end-use applications: carpet, apparel, upholstery, outdoor fabrics, automotive fabrics and other high performance textiles. In addition to the difference in quality, there are also outstanding performance and environmental advantages to solution dyeing. Which is sounding better, carrots or radishes? For more information about solution dyeing visit Americhem’s website at http://www.americhem.com/solutiondye, or leave a comment below with your thoughts and questions.